Get double the coverage and half the hassle of other fish finders with a Lowrance® HOOK2-5 Fish Finder with TripleShot Transducer. Extra wide sonar coverage returns bigger arches to see fish as well as track lures and bait as move through the water. SplitShotTM Transducer with Broadband sonar and DownScan imagingTM show returns on a 5" SolarMAX display with excellent daylight clarity and visibility. Autotuning Sonar actively adjusts settings as the conditions change to let you concentrate more on fishing. Simpler menus and easy-access key functions get this unit from the box to your boat and finding fish in minutes. 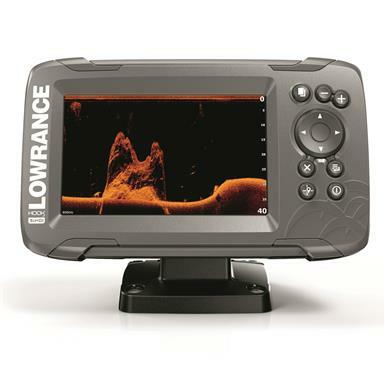 Lowrance HOOK2-5x Fishfinder with SplitShot Transducer and GPS Plotter is rated 4.3 out of 5 by 50. Rated 3 out of 5 by Paparazzi from Average Had to have it rebooted by the dealer. Working so, so. Rated 4 out of 5 by Wayne79 from meets my needs for the price !! I purchased a Tracker TXW and didn't want to spend a lot of money on a unit, so I invested in a Hooks2 5x six months ago, as of today I haven't had any problems with this unit, it does everything I expected it to do, just right for our Florida lakes !! Rated 5 out of 5 by Old Bud from Beyond belief We use this product on one of our favorite lakes. We have been very successful in th past catching fish. With the new Hook 2/5 we are able to double our catch. the ease of operation and clarity of the presentation are beyond all our ex expectations.